Explanation: What's inside this cosmic cave? A stellar nursery 10 light-years deep. 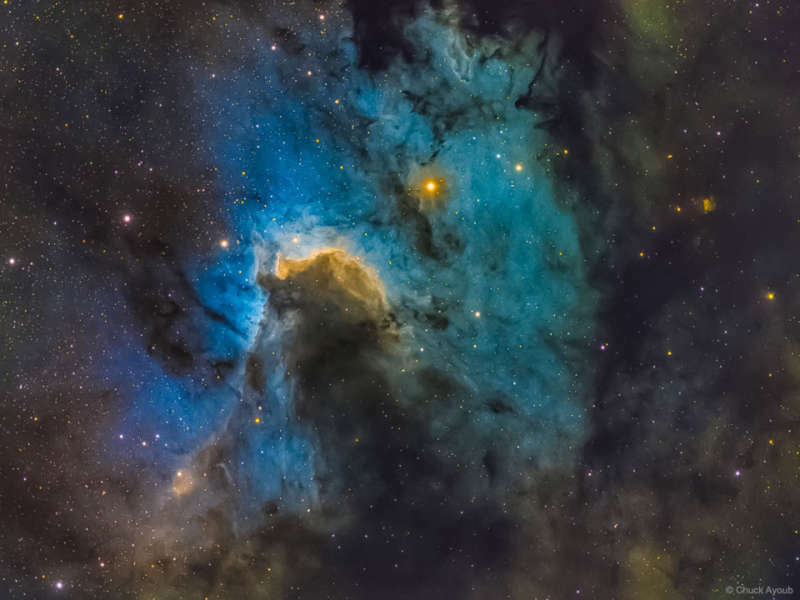 The featured skyscape is dominated by dusty Sh2-155, the Cave Nebula. In the telescopic image, data taken through a narrowband filters tracks the nebular glow of hydrogen, oxygen, and sulfur, colors that together form the Hubble Palette. About 2,400 light-years away, the scene lies along the plane of our Milky Way Galaxy toward the royal northern constellation of Cepheus. Astronomical explorations of the region reveal that it has formed at the boundary of the massive Cepheus B molecular cloud and the hot, young stars of the Cepheus OB 3 association. The bright rim of ionized hydrogen gas is energized by radiation from the hot stars, dominated by the bright star just to the left of the cave entrance. Radiation driven ionization fronts are likely triggering collapsing cores and new star formation within.